944 Pictures 1. Frame page-please click | Cars| below. My reply is always: “And your point is ...?” Hey-- maybe the only diference between Ansel Adams and me is that I have a 944. And that he has talent (no-- not the Diamond-Star product, the Eagle Talon). And in case you care, I just use a plain, simple Olympus point-and-shoot camera for my photos. 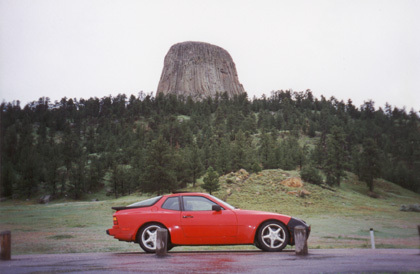 So, without further ado, here are pictures of landscapes, cars, and landscapes with cars. 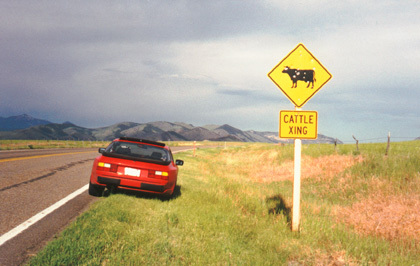 These “Cattle Xing” signs are apparently a problem around the Yellowstone area. Luckily, the locals are able to keep them in check with easily accessible hand guns, as the bullet holes can attest, thus keeping our highways safe from these yellow menace. 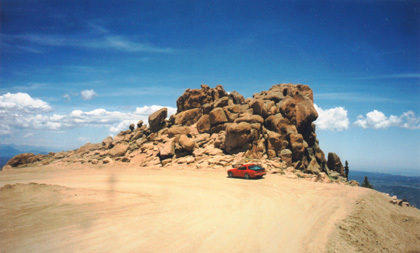 I’m pretty sure that in Germany, I would have gotten a parking ticket for stopping nearly at the top of Pike’s Peak.